Who is #1 and #50? Tennessee is the 2nd most accessible state in America with 41% of its counties having no shortage of healthcare providers. This map shows the status of the HRSA status of every county in America. White indicates that the county has no shortage of health providers; yellow indicates that some of the communities within a county have a shortage of providers; and red indicates there is a health provider shortage throughout the entire county. We did not stop at access as the only issue. 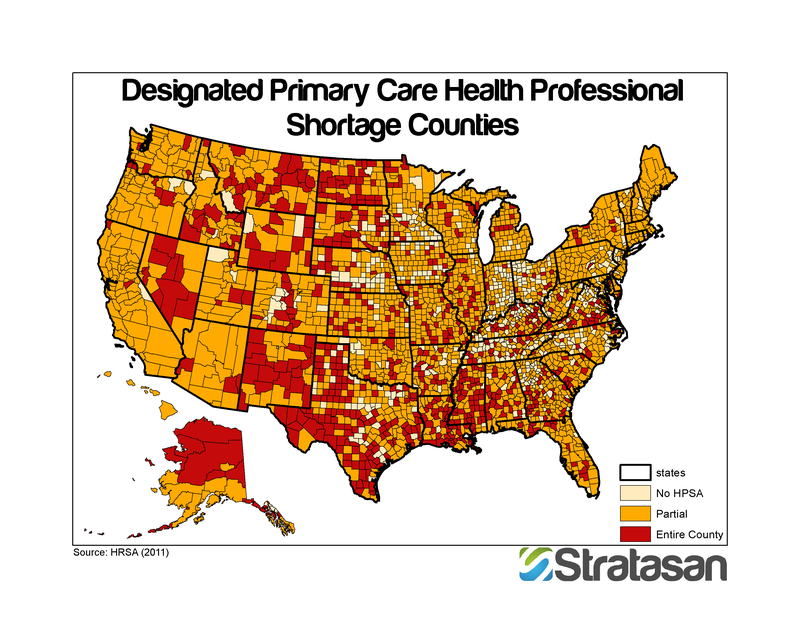 We went deeper into the available data and found the HRSA health provider shortage classification is not necessarily indicative of a healthy or unhealthy county. In Tennessee for example, Benton County is the 95th county for health outcomes but HRSA has determined that Benton is not underserved. Fayette County is the 18th healthiest county, yet HRSA has designated the entire county as underserved. This data shows it takes more than access to hospitals and doctors to make a community healthy. “To engineer a healthy community, it takes a collaborative effort among providers, health plans, industry, government, and public health,” said Dr. Stephanie Bailey, Stratasan’s Community Health and Medical Director and former chief of the Office of Public Health Practice for the CDC. “Creating a culture of health and participation within all community members is required to move the needle. Access to care is only part of the story.” As 2012 rapidly approaches, many hospitals will complete their IRS Form 990 Schedule H when fulfilling their Community Health Needs Assessment requirement. These community health assessments will shed a brighter light on access to quality care within communities and neighborhoods through the United States. If you are looking for assistance in fulfilling your Form 990 Schedule H requirement or looking for proactive measures in understanding your community health needs, email us at sales@stratasan.com.